I took Rocky to get neutered last Monday morning and they had him finished by the afternoon and kept him overnight to monitor him. He came home with an e-cone and two external stitches and some meds. From the day he he came home he refused to walk which was normal but now a week has past and I've administered all his medications on time ( Metacam for inflammation, Tramadol for pain and Panolog cream for help with irritation) and the swelling has gone down significantly and everything on his scrotum looks much better and healed. Still he won't walk very much, he did start to try and walk a lot but he squats while he walks. I took him back to the vet and they said everything looks fine and he can just be taking a little longer to get over it but from what I read most peoples dogs were back to normal in about 2 or 3 days. Just want to know if anyone else had a slow recovery story to put my mind at ease? Poor pup I hope it's nothing bad.. I've owned mostly females so not sure. The vet wasn't concern at all he should be moving some I'd think. Does he eat and go potty fine? He eats a normal amount, drinks a little bit less than usual but he drinks a decent enough amount. Since he has trouble walking I carry him out to the grass and let him do his business , it has gotten slightly better considering the first couple days he didn't not move at all and now he at least moves a little bit to adjust where he is sleeping. I've been in and out of the vet with him and no matter what they give me or what they suggest, it doesn't really get any better. My vet did say it took his female dog 5 days before she was able to walk but it has been a week now for him. Every time he begins to do his funny little walk he'll immediately turn around and try to lick at his incision as if i maybe be itching or irritating him in some way but I don't know what else I can do to help. how old is he? Isn't he around 10 or 11 months? I think it takes a bit longer for older dogs to heal...I have no hard evidence for this, but friends who have had older dogs neutered have had a slower healing time than younger dogs, so maybe that's it? I'm sure he'll be ok, but he may be having a hard time now. (And Shibas can be drama queens too...really acting out when they have any pain, even mild). If it's not better in two weeks, I'd start to wonder, but I'd give him so more time for now. Smaller breed young males seem to be the most melodramatic after their neuters, by licking at the site and refusing to standup or walk. They get over it. It sometimes takes a few weeks for all the swelling to go away and for the shave site to start growing back. In my experience, shaving of the scrotum during the surgical prep produces the most post op irritation in male dogs, and I'm sure it is fiercely itchy for them. If you're a guy, imagine dry shaving your face and then scrubbing it with rubbing alcohol (which is basically apart of most neuter preps). It takes a while for the razor burn to cool off. When I prep male dogs for neuter, I don't shave the scrotum at all and that seems to make a huge difference in their post op experience. I posted in a panic after Koji was neutered, he was VERY unhappy and I was scared...He is totally fine now, but he took about two weeks before normal...first two days were crying/whining non-stop. Thanks everyone! I was just hoping he was being a Shiba drama queen, he's only 10 months so I guess he's just being a little baby about it. I did notice he has been magically moving from the floor to my bed every time I left the room so if he can jump when I'm not around I'm sure he's not in THAT much pain. Now getting his cream on the incision is a whole other story but whether he was healed or not he still wouldn't let me come near him with it but I guess that's a Shiba for you. It took ours about two weeks to start walking around without walk sit walk sit problem. However he is about 8 yrs old. He finally started to walk again, walking a little funny but it's a start. Thanks for all the great answers! Hiro is getting neutered on March 4th. They said the recovery time is 7-10 days. Will he be able to walk up/down the stairs post surgery? I personally carried Sagan up and down the stairs for the first two days since he was totally out of it, but by the third day, he was walking up and down stairs on his own without any problems. Within 3 days the only reason you could tell Zim had been neutered was because of that silly cone. He was probably feeling fully all right by day two, but I wasn't counting the exact days. I do know that the first day he was home he just wanted to sleep but that it wasn't long after that that we were counting the days to his follow-up check-up (exactly a week later) so we could get the cone off of him (he went straight for his incision whenever the cone was off). Our vet said to minimize activity (running and playing), but there was no need to immobilize him. A few stairs should be fine, but if you are talking entire flights of stairs in an apartment complex or something, you might want to carry him. Kouda was sleepy the night of, but after that he was fine. Granted, with the cone on he pouted like a princess, and wouldn't move - just stared off into space or at walls... We had to walk him with the cone off, and then he became his normal (extra) hyper self. We kept the cone on indoors to keep him mellow, otherwise he wanted to play constantly. His incision was 2 cm, and the sutures were internal, and no required follow-up. By day 5, the cone was off completely, and day 9 he was back at the dog park. He was always more persistent at licking his shaved wrist than the incision. How old is Rocky? 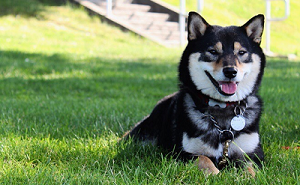 Kaji was neutered around 6 months and had a very quick recovery. I don't remember exactly, but I think he was sore for a day, but walking and peeing. We brought him home that night and had no problems other than him sleeping a lot. He was REALLY happy to come home. We never used a cone since he didn't lick his stitches but a few times, and stopped when we distracted him. I wonder if age has something to do with recovery time. There have been studies that say they heal more quickly when they are very young; it was a reason some are in favor of pediatric spay/neuters, though I am not. It's probably linked in one of the spay/neuter threads around. (I don't think this is a good enough reason to do a pre-puberty neuter, though). That said they do usually heal fairly quickly, but even if they seem to want to be active, it is critical to keep them from being too active (so yeah, if it is a lot stairs, a lot of the time, I'd carry the dog). Because if they are too active, they can get hematomas from blood flowing back into the area. My vet said it's relatively common when people let the dogs run around too soon after the neuter. It happened to my Akita, but he was an odd case--it was more than 2 weeks after the neuter that it happened. That's really rare, and we don't know why that happened. I mean, by that point I was letting him run around again, but then again, even my vet would have said that was fine. It's much more common to occur in the first couple of days/week, I think. Also, just a note, and I would think a vet would notice it during the neuter, but Shibas (and Akitas, and thus likely all the Japanese breeds) have had incidents of clotting disorders, so it's just something to be aware of. if I were to carry him up the stairs, how do I carry him? usually when I carry hiro, his back is faced towards me. I put one arm under his front lets and then my other arm to support his hind legs. Would I hurt him if I supported his hind legs after the surgery? I leaned down, picked him up under his legs, and held support under his body, so he's facing to the side. 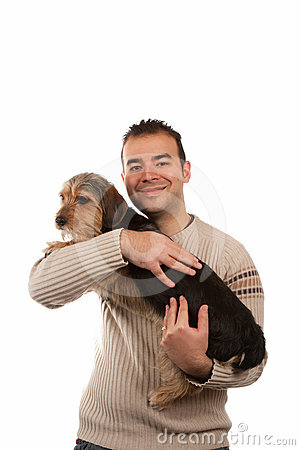 Man, finding a stock photo is harder than I thought! Kind of like this, I guess? Except the arm is more relaxed. I would think that arm underneath would hurt his surgery wound. No? I don't think so? Sagan didn't display any discomfort, and it was only up the stairs, which took like... 5 seconds. I'm sure if it hurt, he'd let you know. As long as you support his weight by resting his body on your arms, I'm sure it will be okay. You just don't want to stretch his skin where the stitches are to avoid ripping them out. Not sure which neutering thread to post on but I am concerned about my pup and wanted to know if anyone experienced anything similar. I apologize for it's length and its unorganized nature, I am in an anxious/panic state. Gaku (7 months on the 9th) got neutered yesterday at our regular vet. He was his normal friendly nature but slept more as expected. I live on the second floor of an apartment complex so I carried him up and down the stairs to use the bathroom. Though he peed normally with his leg lifted, he did not poo. Behavior wise, he was very normal though grouchy with the donut. He was interested in his incision a few times but left it alone if I called his name or said no. At night, just in case, I made some pants out of a pair of leggings. Today, he was the same friendliness, peed and pooed during two 5~10 minute walks. After napping, before noon, he started being extremely agitated with his scrotum and I panicked. It was extremely swollen and hard. I checked it last night (bruised) and a few times this morning (more bruised, a little swollen but soft to the touch) so I knew this couldn't be right. I placed him on my lap at which time he calmed down and called his vet who said that it's normal for him to be agitated with his would but call if it bleeds. After hanging up, Gaku did stayed my lap which is strange for him because he does not like to cuddle except for in the car. I eventually moved him to check on his scrotum to see that there was a bit of blood on my pants. Called the vet and drove him there immediately. Once there, the vet takes him back immediately to check him and came out to talk to me. Turns out he bled more than puppies should during surgery so she was concerned about him. She had a vet tech call me in the morning to check his status because of this (he was fine then). The actual scrotum is full of blood which is why it is swollen. She told me it could have already started clotting at which she would she would tell me to ice it return the next day to check on it. Worst case for that is that blood would stop going to the scrotum and it would scab and fall off. Uncomfortable but harmless. But, as they are closed tomorrow, she feels that it's risky to leave it as such and would prefer to be aggressive, find the source of bleeding, and stop it. This would be result in being sedated again, having a bigger incision, and a longer recovery time. She left it up to me. I asked about the risks involved with a second surgery (anesthetizing twice in two days) at which she told me he reacted well yesterday and feels he will be okay this time. Ultimately I decided that I did not want to risk "what ifs" and be in emergency care if something goes wrong while waiting it out. He had his surgery and the doctors are currently watching over him. I will be picking him up later. I am seriously heartbroken about this and have been on the verge of tears but trying to stay strong for him because he's the one suffering. Has anyone's dog had excessive bleeding during surgery? Or had any issues post-neuter not as a result of licking? What ultimately happened? I don't have any experience with this but I am keeping Gaku in my thoughts, hope he recovers soon. Poor baby.